Awesome Freebie Alert. Are you an Amazon Prime member? 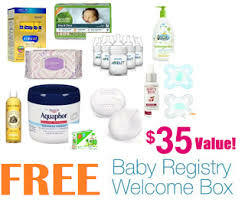 If so you can get a Free Welcome Box ($35 Value) when you sign up for a new Amazon Baby Registry. Not an Amazon Prime member yet, Sign Up Now For Free A Free 30 Day Trial and claim your freebie during this time! The welcome box includes full-sized products and samples. I signed up for this last year when I was expecting and it was the best baby registry box I received! You will see “Your Free Welcome Box” on the left hand side of your screen, and a list of steps required to receive the free box. You will need to add items in each category to your baby registry. Once you have completed all of the steps you will see a “Claim Here” link under your Free Welcome Box link on the left hand side of the screen. Click to claim your free box and check out as normal. This box will show up as $0 at check out. Enjoy your new products!